The Ugly Truth About Plastic Bags | Live. Learn. Love. Eat. We took a trip to the dump yesterday and my heart sank in my chest! We live in a small town, but still the amounts that people throw away astound me. There are also so many things in there that could have been recycled or reused. So much of that stuff, clothes, couches etc, could have been donated or given to people who need it and so much waste that is really just so unnecessary. It literally made me sick inside to see how much people consume and how this consumption is going on ALL THE TIME! It also made me think about what more I could be doing myself. We do live a pretty Eco-friendly life. I always but second-hand clothes and household things, we use natural cleaners (mainly vinegar), I cook all my meals at home (nothing comes from a package that isn’t reusable or recyclable) and we don’t eat meat. Still, I wish I could do more. I figured one way to start doing more about this consumption/waste problem is to blog about it. I am going to make an effort to post about how to be more environmentally friendly and learn more about what our family can do to use less and waste less. I added a tab at the top of the page for where I will share all of my tips with you and hopefully you can apply them to your life too. If enough ones get together and make a change, we can make a difference. Thinking about all of this made me realize that the problems that our health and the health of our planet face today, have really all stemmed from one place, and that is selfishness. We want things bigger, faster, cheaper and we want everything five minutes ago. We don’t want to have to wait. We don’t want to have to spend too much. We don’t want to have to think too hard (or at all) about the detrimental effects our lifestyles are having on our planet, because why should we care? We won’t be around to see them! We are a very selfish and spoiled bunch of people. No one is exempt from this selfishness, it is the culture that we live in. It seems that everything comes in some sort of package. We have lost touch with how to actually grow our own food and live off the land. We rely on supermarkets to get our food, which, even when it doesn’t come in a package (fruit for example) has been shipped half way across the world to get to us, causing a lot of pollution. We pretty much need to harm the earth in order to survive, but there are ways we can do less harm, which eases my mind a little and makes me feel better inside. There are many, many ugly truths to expose surrounding human selfishness and convenience, but one that has been plaguing my mind for a while now is plastic bags. We’ve been hearing a lot about plastic bags these days and stores are taking steps toward phasing them out, but remember that the consumer is the most powerful. You have a say every time you purchase a product and choose to take a plastic bag. You decide to keep plastic bag production going, by using them, when you don’t need to. I know, I know, that would mean purchasing a reusable bag for $1.00 and then actually taking it all the way with you to the store every time. That might just be a little inconvenient for you and you don’t want to have to do anything. Plastic bags are already at the store and so convenient. I beg you to open your eyes and just look around at where our selfish and spoiled attitudes have gotten us. We are in crisis and we are not even aware of it. It’s time for each of us to wake up and take some action. Switching to a reusable bag is not that inconvenient, at least not in comparison to the effects that plastic bag use has on our planet today. Canadians use 9-15 billion plastic shopping bags every year. An estimated 12 million barrels of oil is required to make that many plastic bags. Society’s consumption rate of plastic bags is now estimated at well over 500,000,000,000 (that’s 500 billion) plastic bags annually, or almost 1 million per minute. Each high quality reusable bag you use has the potential to eliminate an average of 1,000 plastic bags over its lifetime. The bag will pay for itself if your grocery store offers a $.05 or $.10 credit per bag for bringing your own bags. Americans throw away approximately 100 billion polyethylene bags per year. 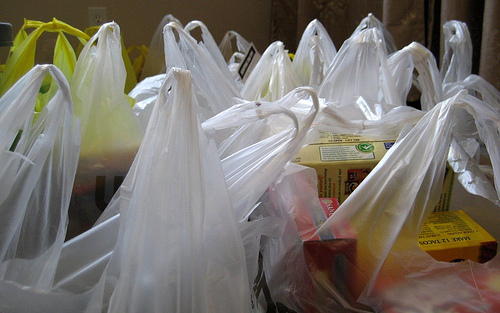 Plastic bags are made of polyethylene, which is a petroleum product. It takes 1000 years for polyethylene bags to break down. As polyethylene breaks down, toxic substances leach into the soil and enter the food chain. The market price for recycled bags in Canada is $55 per tonne which is about 150,000 bags. The energy and funds required to collect and process plastic bags far exceeds the $55 market price after recycling. Recycling plastic bags just isn’t worth it. The average plastic bag is used for five minutes to carry your purchases home, yet these single use plastic bags can take up to 1000 years to break down. Canadian plastic bags have been found as far away as Scotland. Because plastic bags are easily transported by wind and water they can travel great distances. Plastic bags are now common everywhere from Spitsbergen (78° North latitude) to the Falkland Islands (51° South latitude). Buy a reusable bag! I suppose you saw that one coming. Just do it… please? For my children and theirs. Think of the bigger picture. Keep your reusable bag in a convenient place. I keep mine by the front door so that when I head out I can just grab it. You can also keep a few in your vehicle. HA! No excuses! Recycle your old plastic bags. Please do not throw them away in the garbage, where they end up in the landfill and eventually blow into the ocean. Inform others about what the effects of plastic bags are on our planet. Check out this site to get further information and take action. Please take this simple step today. It is a small thing that we can all do. One does make a difference. Thank you for this reminder! I personally think that plastic bags will go down as one of the worst inventions of our time. They are showing up everywhere … the oceans, lakes, sewers … I’ve even found them deep into the forest when we’ve been hiking. The thing is, they do break down into tiny little plastic pieces which animals & marine life mistake for food … and that does two things … it introduces plastic into our food chain and it kills the animals, fish, etc. My opinion is that every time we find ourselves doing something out of convenience, or we try to make ourselves too comfortable, we need to stop and ask ourselves if we’re hurting the environment … because chances are, opting for comfort and convenience carries a very high environmental price. “every time we find ourselves doing something out of convenience, or we try to make ourselves too comfortable, we need to stop and ask ourselves if we’re hurting the environment … because chances are, opting for comfort and convenience carries a very high environmental price.” I completely agree!